Can active funds really beat an simple index funds? 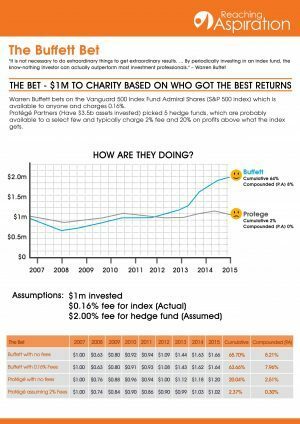 5th October 2016 14th April 2017 Dave ColleyWealthLeave a Comment on Can active funds really beat an simple index funds? While statistically active fund managers in the UK and SA tend to do better than their US counterparts. Over time it seems the house (or the market) always wins or index funds out perform active fund managers. There are a handful of people that have consistently beaten the market. To name a few, Warren Buffett, Ray Dalio and David Swensen. All of which I do not have sufficient funds to access these individuals. I have no idea why people continue to try to pick which fund managers will potentially outperform the market, especially when this based on 20 minutes (probably generous) of research. Money Master the Game – Tony Robbins has the passion and connections to access the greatest investment minds of our generation. The interview with Ray Dalio alone is more than worth the price of the book. Money. PANIC! The 7 Steps to controlling your Personal Finances – For a more structured and faster approach.